omel State Circus was opened on December 2, 1972. A futuristic shape of its building located in the very center of city is one of Gomel' recognizable symbols since. In 2006, new prominent landmarks appeared next to the circus building — fountain with dynamic illumination and a statue of famous Soviet clown Karandash (M. N. Rumyantsev). (3D panoramic view of Gomel, 6.10.2011. Auditorium of the circus proposes 1544 seats for spectators. Each season that lasts from September till May/June our circus presents five to six shows. The shows are formed mainly of performances of invited circus actors and groups. For the actors being on tour and visitors of our city, the circus proopses numbers in own cosy hotel located in the neighbourhood. Staff of our entertainment and culture complex numbers above one hundred emloyees that provide regular operation of all our services. Thanks to that, our spectators always get the brightest impressions both of the actors performances and the circus visit itself. Heads Gomel State Circus and carries out duty of its art leader General Manager Honoured Cultural Worker of Republic of Belarus Yakov LOBOVICH. 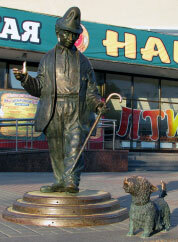 Gomel State Circus has a comfortable location in the center of city where are a lot of public transport routes. 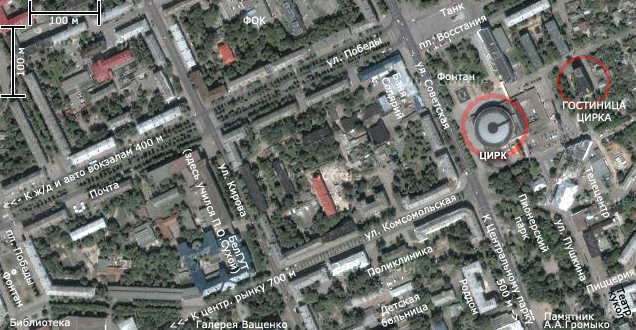 There are car parking areas in the circus neighbourhood (Vosstaniya Sq.). 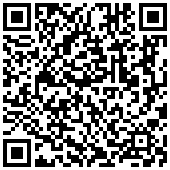 • railway and bus stations, General post office, post offices, bank departments. CIRCUS (Sovetskaya St., 27). First building of circus (wooden) has been constructed in Gomel in 1890th by private entrepreneur I. Slobodov on the area of Central Market (former Horse Square) and existed till 1917. In the circus, gave performances companies of K-Mumino (1896), Chinese-Japanese of Dalai Lama (1910) and Japanese Court of Yamasaki-San (1919), circus of A. Devinie (1901), Lar (1910) and A. V. Lapiado (1909, 1912), 'Russian Coliseum' of F. Durov (1909), 'Decadance' (from Dvinsk, 1913). The circus auditorium was also used for theatre performances and concerts. In 1926, on street Komsomolskaya of the city (now Lenin Avenue) a new circus building was opened (for 2 thousand seats), where circus groups from Russian Federation gave performances. In 1932 the circus building was transferred to Byelaryssian Third State Theatre (BST-3), in 1939 Russian Regional Drama Theatre opened in it (in 1941 the building was burned down). In 1950th a circus-chapiteau worked in Gomel. 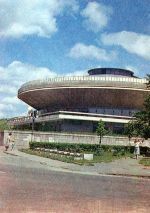 Modern building was constructed in 1972 based on the reused project of A. Kudryavtsev (Moscow), Yu. Motorin, M. Shulmeister, Sh. Khinchin (Gomel). A composition consists of several spaces united by a rectangular in plan floor. In the building silhouette, dominates a dish-shaped amphitheatre roofed by sloping spherical dome. 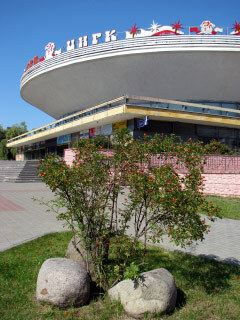 Here the entertainment portion of the building is located (auditorium for 1856 seats* with arena, stage and orchestral area); Soviet and foreign circus groups gave performances. Main volume is situated on rectangular in plan stylobate where ticket office hall, cloakrooms, front stairs, office, dressing rooms and service premises are located. The amphitheatre is surrounded by a paned foyer having exits to terrace arranged on the roof of lower volume. Animal enclosures are situated in the patio and are linked with the arena directly. In the building neighbourhood there are area with decorative pool, flowerbeds, the Yuong Pioneer Park. * After reconstruction of the auditorium in 2006 number of seats makes 1544. During 45 seasons (form December 1972 to June 2017), about 14.477 million spectators have attended shows in Gomel State Circus. Gomel State Circus appeared among other forty new stationary circuses that Council of Ministers of the USSR decided to build in 1964. Circus in Gomel is second one stationary circus in Belarus after Minsk. The circus building project was intended for construction in six cities of the Soviet Union: Krasnodar, Nikolaev, Grozny, Zaporozh'e, Gomel, Stavropol'. How do they look, these circuses constructed according to the same project? The fountain at the site left to the circus after the reconstruction in 2005—2006 was opened on May 9, 2006. Each day from May to September, Gomel townsmen and visitors to our city can enjoy a variety of flowing shapes, which at night are complemented by an impressive dynamic lighting. * Illumination starts: May, September — since 20:00; June to August — since 21:00. * The cycle duration — 15 min. Biletsky St. (in front of Medical University). In Soviet district of Gomel a new fountain was opened on the City's Day September 9, 2006. Stop: "Circus" or "The 8th of March Plant ". Statue of famous Soviet clown Karandash (M. N. Rumyantsev) has been festively opened in front of Gomel State Circus on June 1, 2006. Sculptor: Vyacheslav Dolgov. 2005 — reconstruction of pathways and the grounds around the circus building. — replacement of sound equipment (JBL set installed). 2010 — reconstruction of the circus facade (replacement of the basement windows). 2011 — reconstruction of the circus dome' frieze. 2012 — replacement of the spotlights (four Canto 2000 MSR installed).